KABUL: At least eight civilians were martyred and 40 others wounded when a roadside mine explosion hit a bus in western Farah province on Tuesday morning, Farah’s provincial governor office confirmed in a statement. The incident took place at about 4am local time after a passenger bus traveling from Herat to Kabul hit a roadside mine, according to the statement. 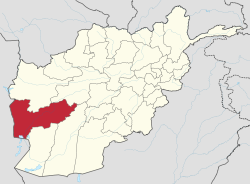 ”The incident happened in Lakhshak area in Bala Blook district of Farah,” the statement added. Extending condolence President Mohammad Ashraf Ghani condemned the attack, adding targeting civilians, including Ulema, women and children were against principles of Islam and that Afghan and world Islamic scholars have called it Haram. “I extend my sympathy and condolence over martyring of a number of our innocent compatriots to their families and wish urgent recovery for those injured in the incident,” the president added. No group including the Taliban have yet claimed responsibility for the blast.